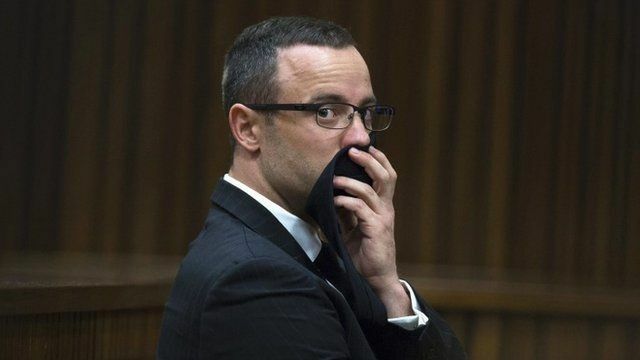 Judge orders Pistorius evaluation Jump to media player A judge in the trial of South African athlete Oscar Pistorius has ordered that he should undergo a mental evaluation. Pistorius has 'anxiety disorder' Jump to media player Oscar Pistorius has had an anxiety disorder since childhood and was "anxious" about violent crime, a psychiatrist has told his murder trial in South Africa. Pistorius trial - 12 May - in 60 secs Jump to media player South African Olympic athlete Oscar Pistorius has had an anxiety disorder since childhood and was "anxious" about violent crime, his trial in Pretoria hears. Neighbour mimics Pistorius 'cry' Jump to media player Two of Oscar Pistorius' nearest neighbours said they heard a man crying loudly on the night the athlete shot his girlfriend, Reeva Steenkamp. Pistorius 'broken' after shooting Jump to media player South African athlete Oscar Pistorius "was broken" after shooting his girlfriend, his neighbour says, as the murder trial resumes after a break. Pistorius trial day 28 - in 60 seconds Jump to media player The murder trial of Oscar Pistorius hears testimony from ballistics expert Tom Wolmarans. A judge in the trial of South African athlete Oscar Pistorius has ordered that he should undergo a mental evaluation. She ruled that psychiatric evidence before the court could not replace "a proper enquiry" into his mental health. The prosecution argued on Tuesday that psychiatric tests were essential and that he should be referred. Mr Pistorius denies intentionally killing his girlfriend Reeva Steenkamp on Valentine's Day last year.